Since my new laptop is 'dead' at the moment, I have to use my old laptop to do my online stuff. It's a 7 year old laptop so you can just imagine how slow it is. Aside from being, yes, old, it also has a lot of files which make it even slower. Oh and it dies once in a while as well but at least I can turn it back on unlike the new one. Anyway, as I was going through the files on this laptop, I came across the little one's baby pictures. 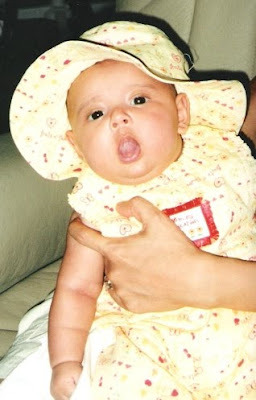 There's a bunch of them actually & I can only shake my head wondering where time went as I look at her baby pictures. She was a little fatty until she was about 2 years old. Hubby and I used to joke that she may just need some diet pills when she grows up because she was really chubby. Look at her in this picture. I think she was about 3 months here. But as she grew older, she also started to lose the baby fats. Right now, she's really slim. You know what's funny, Mommy still has the 'baby fats'.....sigh! can I say, that I too is starting to accumulate more baby fats? blame it on my baking, kaya I may be forced to do a revamp on my Friday sched soon. early today for a change. napaaga ang gising dahil sa short ribs (LOL). it's been on the slow cooker for a few hours, and now I'm starving haha. hope you're having a good Thursday. I agree with ate Beng! Your little one ( that is not little anymore ) is like a doll! Hay! Kelan kaya ako magkaka girl! Speaking of baby fats....I'll be worrying about that after my c-section..Sa ngaun todo kain muna, hehe!